Try your hand at milking! The hacienda has been associated with the railway since it was first built, using the train to transport the farm's produce to sell at market. 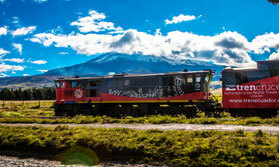 Nowadays the railway brings guests to Hacienda La Danesa, to enjoy the hospitality of the Olsen-Peet family and spend time on the 500-hectare estate near the Andes mountains. The working dairy farm forms the core of the estate, and there are teak and cacao plantations, so there is plenty going on. As a guest you can lend a hand with milking, tour the cacao plantation to learn about chocolate production, and take part in cookery classes. Outdoor pursuits such as horse riding: the estate breeds its own horses, river tubing and mountain biking are all possible, and day trips to nature reserves and archaeological sites can be arranged. There is a variety of accommodation. Two rooms are in the main farmhouse, with their own entrance so you can xome and go as you wish. Each bedroom is en-suite and together they share a private part of the garden. Another room occupies part of the restored stable block, and has a bathroom with a rainfall shower plus an additional outdoor shower in the private garden. It has the benefit of an entertainment system, Wi-Fi, a hammock and yoga mat. There is also a guest cottage. With a large bedroom, bathroom and a veranda it can accommodate up to two adults and a child, and has a hammock, minibar and coffee machine. Staying on a working farm you would expect the food to be fresh and tasty and this is indeed the case. The skillful use of locally grown organic, seasonal produce results in delectable dishes which you can enjoy indoors or on the terrace. During your stay you can sample some of the products made on the farm including jams and chocolate.